Everyone who rides a cargo bike has, somewhere down the line, got questions like: Did you build this bike yourself? Can you actually buy this bike somewhere? Riding a cargo bike has been perceived as different for a long time. “In the Tradition of Volkswagen being one step ahead, we are just now working on solutions for the challenges of tomorrow and thinking ahead about sustainable mobility for our customers and for better air quality in our cities,” said Thomas Sedran, Chairman of the Volkswagen Commercial Vehicles Brand's Board of Management. Well, one step ahead? It's about time! The end of a subculture. Cargo bikes have long been – or at least were perceived by car drivers – as part of a different culture. It was a seperate, cycling culture, a collective of people who enjoyed nothing more than thinking about the next trend in bicycle frames, about cycling around the world, or perhaps starting the next revolution. Indeed, riding a cargo bike has long been perceived as a statement. For some, cargo bikes have been a strategy of distinction against a powerful mobility mainstream culture. Now that Volkswagen has joined the exclusive family of innovators, cargo bikes have perhaps lost the last touch of counter-culture. Put simply, riding a cargo bikes will no longer be a subversive act and cargo bikes will return to the status they had more than a hundred years ago. We hate to break this to you, but cargo bikes are back in the mainstream! The catharsis of a cheater. VW will dig into the cargo bike market. Soon, Volkswagen will present a new version of the cargo bike for families and additional accessories for transporting children. Everything will be well designed, with an attractive cost-benefit ratio. Because this is not any company. It's Volkswagen after all, a company with revenues of €230 billion in 2017, 642,000 employees, operating profits of €17 billion and a net liquidity of EUR 22.4 billion. Volkswagen is the company which was caught cheating about the emissions of its diesel cars. Just to recall, it was the US Environmental Protection Agency (EPA) that accused Volkswagen in 2015 of having intentionally programmed diesel engines to activate their emissions controls only during laboratory emissions testing but emit up to 40 times more NOx in real-world driving. VW got caught. VW has finally got it! It seems that Volkswagen has finally understood that a better strategy than cheating about the emissions of its vehicles is to enter the booming market of cargo bicycles. 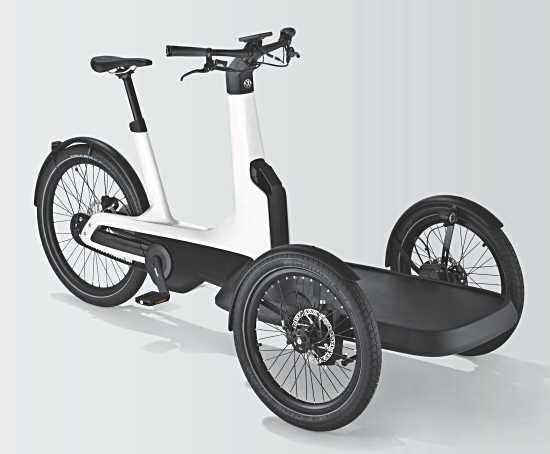 The bicycle that was presented at the IAA is a 206 cm long and 89 cm wide three-wheel delivery cycle with a 250 watt engine. It's range is up to 100 km from a 48-volt, 500-Wh lithium-ion battery. It is an entry level product for a market segment that is growing each year. Market entry is planned for 2019. VW has developed a bicycle with tilting axles and sufficient space to do what it should: transport cargo. The drive and rugged architecture of the bicycle are designed for a maximum payload of 210 kg (including the rider). It will be produced at the Volkswagen Commercial Vehicles plant in Hannover. Cargo bikes are super normal. VW is promoting its cargo bike as a last mile solution: It can be used anywhere and anytime, even by people without a driving licence and in places where cars have no access or diesel engines are banned. Breaking news! 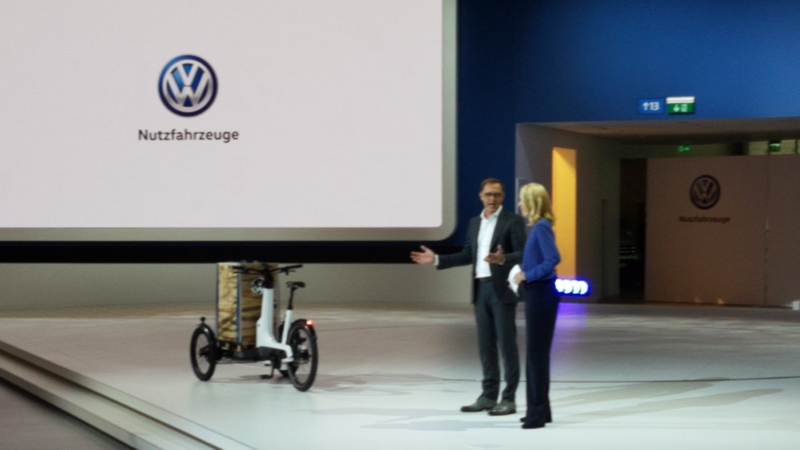 “The cargo e-bike is VW’s solution for the mobility challenges of tomorrow,” said Mr Sedran. And this is where it becomes scary. Because we have to agree with VW and Mr Sedran: cargo bikes are indeed nothing less than a solution for the mobility challenges of tomorrow. Cargo bikes have finally entered the mainstrean. They have become super normal. Now, even VW produces 'em!